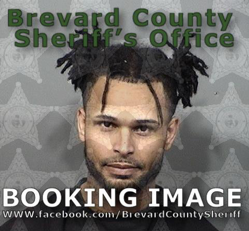 Early this morning the Brevard County Sheriff’s Office has arrested 28-year-old, Teddy King of Merritt Island, for an attempted burglary that occurred at the Brevard Travel Service, located at 511 North Courtenay Parkway, Merritt Island. King was charged with Attempted Burglary, Possession of Burglary Tools, Resisting Arrest without Violence and Felony Driving While License Suspended. He is currently incarcerated at the Brevard County Jail on $6,500.00 Bond. The arrest occurred after a concerned citizen, who lives near the business, called the Sheriff’s Office shortly after 5:30 a.m. The caller advised that he heard what sounded like loud banging at the rear of the business. Deputies responded to the business and observed King on the roof of the business who ran once he noticed the deputies. A short foot pursuit ensued through the neighborhood. A perimeter was established, which captured King as he attempting to leave the area in a vehicle. The vehicle King was driving has been impounded pending a search warrant. The methods of King’s actions are very similar to several other burglaries that have occurred throughout the county. The investigation is continuing in an effort to determine if King is responsible for any other burglaries. King has a criminal history, serving sentences in the Florida Department of Corrections for previous felony convictions. Crimes Unit at 321-454-6640 or CRIMELINE at 1-800-423-TIPS(8477). All calls to CRIMELINE are confidential and callers can remain anonymous and be eligible for a reward.